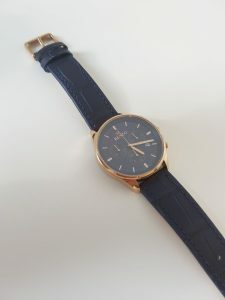 Usually whenever someone mentioned about Swiss-made watch to me, my first thought in mind would be “expensive”. 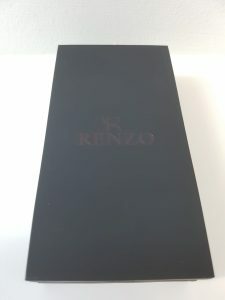 Well, this perception of mine could change soon, if more brands like Renzo would surface with Swiss-made watches and offering affordability price to watch lovers like myself. 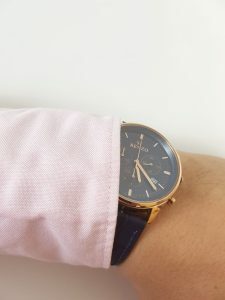 I was fortunate enough to be approached by them to do a review on their first prototype model, Swiss Chronograph which is currently on Kickstarter. So let’s do a quick run through of the technical specifications of Renzo Swiss Chronograph and an update on what the changes will be in compared to the prototype after gathering feedbacks and inputs from various sources. What will be upgraded or changed for the production model ? So, what are my thoughts of it ? 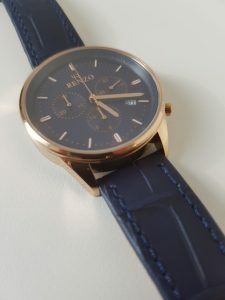 When I spoke to Renzo, they were kind enough to offer me to choose from their variety of choices, and what really stood out from the rest of the options was the Rose Gold with Blue dial and a matching Blue strap. So I opted for that as my hands-on review in today’s write-up. Case : At 40mm it’s just nice, but the updated version of 42mm would be even better. 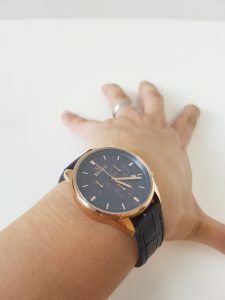 However, my review is based on the 40mm and it fits nicely on my Asian wrist size. 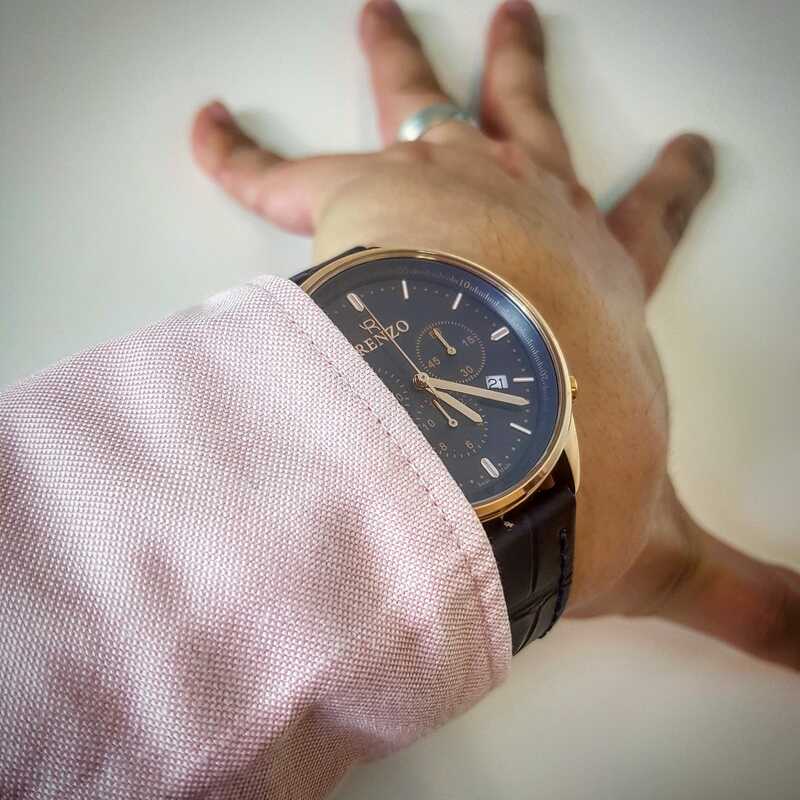 I love the polished finishing of the case and how it matches the hands and indexes on the dial and sub-dial. 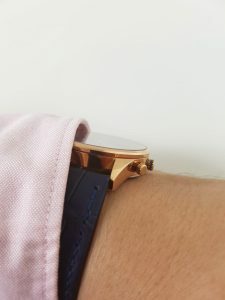 The crown has a ring in between it with the colour matching the dial, which is definitely a nice touch but this will be removed in the production version. 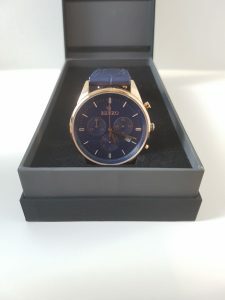 According to Renzo, the main reason they opt to remove it is because it only matches with the same colour strap but if one were to swap it to a different colour strap, then that might look awkward. 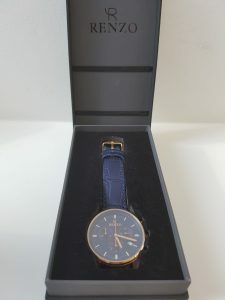 To me, I have to disagree because it doesn’t matter what colour the strap would be fixed on, the ring is definitely a nice touch to the crown. Dial : It looks like it has a matte finishing on it, with applied indexes on both large hourly and small dotted lines in between to represent the minute. At 4 o’clock position, there’s a date feature, but I would have like it if the background of it matches the dial colour accordingly. At 6 o’clock position, there’s the “swiss made” iconic theme representing the watch meets the minimum requirement to be able to display that on the watch. Surrounding the dial is another layer of dial at 45° with more lines and interval of 5 minutes display. However, this was almost non-existent to me as I can barely notice it was there. Sub-Dial : There are 3 sub-dials within the dial, where the top right is not part of the chronograph feature. 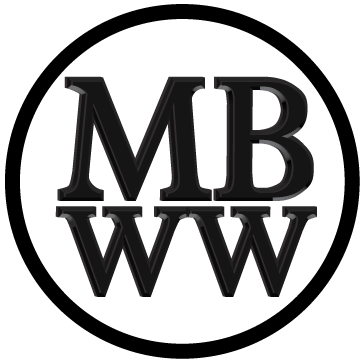 It is an active second movement for the watch. On the top left is where the minute movement of the chronograph and it’s only for 30 minutes, which means every 2 round of it would be 1 hour and activates the bottom sub-dial of this feature, displaying 12 hours. Unlike the main dial, this sub-dial has a sunburst feel to it with circular texture from inside out of it. Nice combination of having matte on the main dial and sunburst on the sub-dial. 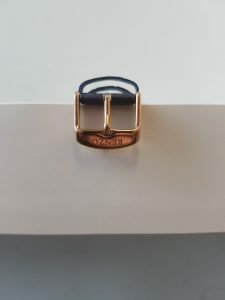 Caseback : Very simple design, with the “R” logo in the center and information on the material, water resistance and where it’s made. 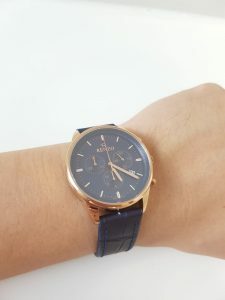 Strap : Mine came in a dark blue croc calf leather with quick release feature. 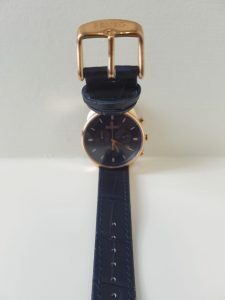 I like the softness of the strap, and how the stitching colour matches it. It would have been classy if it came with a matching deployant clasp instead. For the current Kickstarter price of USD199, I can’t find much fault to it except it not being automatic but that would mean the price would be much higher, right ? The only comment I have is that they have too much variety and option, which would make it confusing at times because of the total number of choices available. I would have preferred if they have stuck with just a few dial colours, straps, etc. 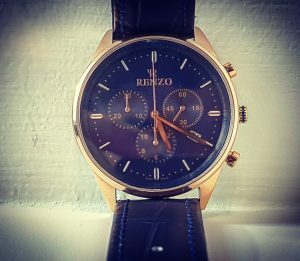 Nonetheless, for anyone that is looking for a dress watch with chronograph feature and on budget for a swiss-made brand, then look no further as Renzo is your go-to watch especially with the updated changes.